The Ricky Flynn Motorsport team has just successfully completed the 2018 FIA European Karting season at the French circuit of Essay. 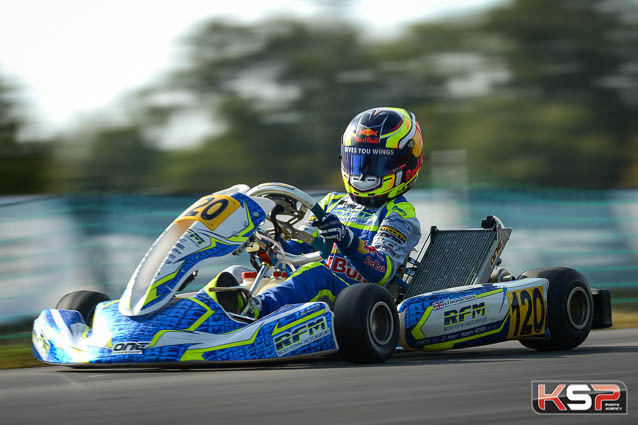 Paul Aron was able to maintain leadership in OK-Junior to clinch his first European Championship title while Kai Askey finished in the top five. Harry Thompson led a good battle in OK to move up to 2nd position in the Championship, followed in 4th place by Zane Maloney. The RFM FA Karts with Vortex engines by One Engines have once again been among the top performers in both categories. Leader of the Junior ranking when arriving at Essay, Paul Aron played a careful card to ensure the title win. The Estonian had to ensure his performance without falling, which he did brilliantly. Able to raise the pace when necessary, his 5th place in the Final gave him his long-awaited reward. However, Kai Askey was the fastest of the RFM boys at the beginning of the meeting. 3rd fastest in Qualifying, he won three heats and moved up to 2nd place. Unfortunately, he was caught in several incidents in a high pressure Final and dropped to 13th place, which earned him 5th place in the Championship. Thomas Ten Brinke raced intelligently in the heats and gained another three places in the Final to finish in 8th place and enter the European top 10 in his first full season in Junior. There was also progress for Zak O'Sullivan, who had a great Final in 4th place and was 11th in the Championship. Conrad Laursen was delayed by a heavy penalty in the second heat after a mid-placed Qualifying, but regained ground in the Final and finished 13th in the Championship. Matthews Rees was fighting in the pack because of a distant Qualifying position and was unable to qualify for the Final. The two OK drivers in the British team consistently held the top spots at Essay. Harry Thompson was 2nd fastest and won four straight heats. He gave his all to ensure the 2nd place finish which allowed him to become vice-European Champion on his 14th birthday. Zane Maloney took five 2nd places in his heats before finishing in the top five with the second fastest time of the race to take 4th place in his first OK Championship. The Kristianstad World Championship (SWE) will be the last big event of the FIA ? ?Karting season from 20th to 23th September. But before that, the RFM drivers will meet in Genk (BEL) for the final of the German Championship in which Thompson and O'Sullivan dominate in OK and OK-Junior.